Before the concert of Strictly Strings, Seattle Modern Orchestra co-artistic directors Jérémy Jolley and Julia Tai presented a slide show about string techniques explored by composers Claude Vivier, Iannis Xenakis and John Adams. The highlight of the presentation was when Jolley pointed out that the filled-in triangle in the Seattle Modern Orchestra logo was the symbol to play the highest pitch, not an umbrella. The concert started with Zipangu by Claude Vivier. Zipangu was a difficult work to understand. The balance between the violins, violas, cellos and lone string bass was uneven and the pauses were awkward. I wasn’t sure whether this was the venue, orchestra or composition. Vivier himself was an intriguing character. Born in Montreal to unknown parents, he studied with Karlheinz Stockhausen in Cologne and lived in Paris where he was working on an opera based on the death of Tchaikovsky. He was murdered in Paris just shy of his 35th birthday. Lonely Child for soprano and orchestra continues to be one of my favorite works, but Zipangu based on Vivier’s travels in Japan in the 1970s, felt emotionally distant. Syrmos by Iannis Xenakis was similarly distant in a different way. Jolley and Tai mentioned that Xenakis was influenced by mathematical models and architecture. The glissandi effects, mass sororities and spatial pizzicati continually moving around the orchestra caught my attention. The concert concluded with Shaker Loops by John Adams. It was a joy to finally hear this composition performed live. 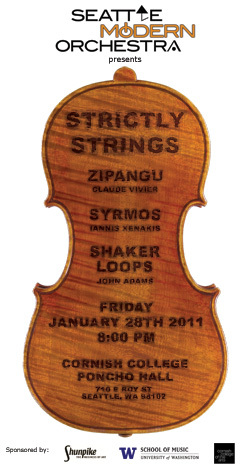 Shaker Loops continues to astonish me with a continually evolving sense of direction that never actual resolves. With Tai’s conducting, the Seattle Modern Orchestra sounded precise and nuanced. Their sound filled the hall with gentle tremolos and exciting accents. Listening to these three compositions from the late 20th century, I wonder about the future of live performances of contemporary classical music. Speaking with Tai after the performance, she mentioned that this concert was volunteer driven. I was heartened that the composers I admired in college are admired by energetic performing musicians and appreciative Seattle audiences.